It is the month of Janus when we take one last long look behind at the year that was and then after this reflection, we turn away from the past, look straight ahead and step forward into the unknown next. 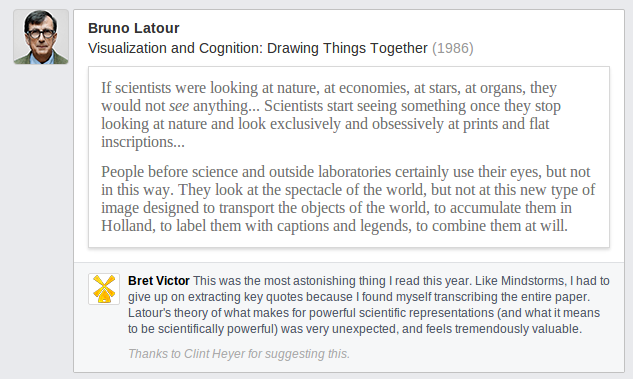 And that is why I started my 2014 by doing some reading from Bret Victor’s annotated bibliography of favourite puzzle pieces of 2013. I enjoyed this essay very much. I knew that education feels to me like its made out of a multitude of conflicting missions but Egan’s piece help clarify to me how they can be reduced to three elemental ones and, more importantly, that each one of these inherently conflicts with the others. And this reading is timely because (as of today) there are a couple of conversations unfolding online that are similarly trying to tease apart the original mission of the library to find when and how the spectre of neoliberalism began to seep in. On that note, I would like to suggest that the mission of the library is similarly bound to three ideas and just like Egan’s three missions of of education, the triad of missions within libraries both support and undermine each of the other. I think that this perspective of this trellus of mission statements is useful because it can explain why some of us in our profession see a future that may end in five years while the rest of us can’t see any end of a need for a deeper and more critical understanding of knowledge creation within the scholarly sphere and the outside world for our students and the community at large. The institutional need for having a library to provide the *supplemental* texts (mandatory texts being textbooks and on reading lists) that support student and faculty teaching and research seems less urgent *institutionally* with with every year that passes due to the growing ubiquity of internet access and the apparent ease of finding and acquiring material through Google (or through email or by other means if necessary) that satifices. 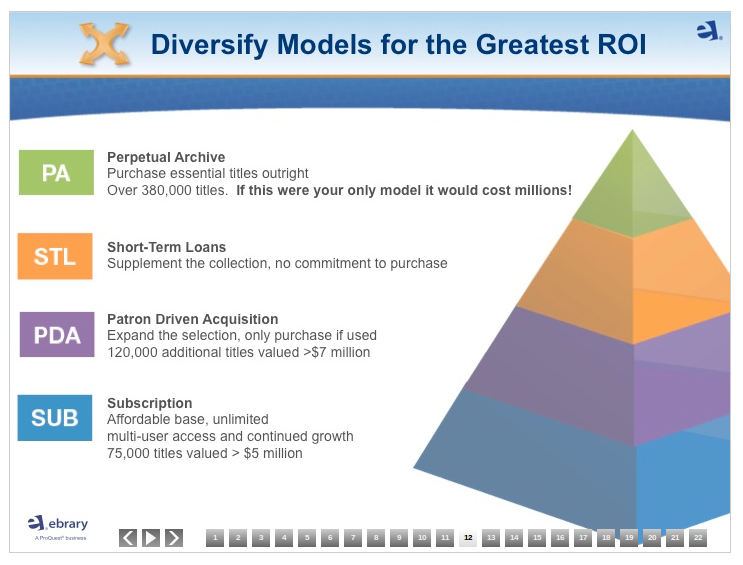 And with every year vendor-publishers continue to develop and grow their aggregations of turnkey collections of ebook, video, and digitized primary research materials and slice those collections into a variety of models to meet the ROI needs of each of segmented markets within the academic sector. Why spend millions of dollars on owning when you can rent? I remember of one of my first job interviews for a librarian position in a chemistry library for a large multi-campus university. When it became my turn to ask a question to my interview committee, I naively asked if I was to support to the work of the faculty of the researchers and students of the Chemistry department, or was I supposed to support the chemistry needs of the university as a whole. Even though this was over a decade now, I remember quite clearly the Chemistry faculty member on the committee lean back, put his hands behind this head, smile and say ‘That’s a very good question’ and then not answer the question. Now, over a decade later, all I have are more questions with no definitive answers. Now I wonder, if the institution's overwhelming and immediate concern is to cut costs and if you work in a library (which is what is charmingly referred to as a cost center in the business literature) well, then what is that library supposed to do? The common response has been to spend more energy aligning the library's goals with the larger institution and to provide the larger institution with evidence and anecdote that describes how and how much the activities of the library actively contribute to the metrics that define success within the institution. Perhaps this has always been the case but I think what has changed is that until recently, the concerns of balancing the library’s requirements within the institution has been primarily the responsibility of library administrators. What seems to have changed is that there is an expectation that the profession as a whole should start to adopt institutional metrics. To these ends, Information Literacy standards were formed. Lists of official competencies were drafted. But to what end? (Measuring an elephant is not the same as feeding an elephant). I like to think there's another way forward. If librarians are taking on more of the administrative work of justifying their labour in an institutional context, I think we should expect more library administrators to increase their efforts in championing our work towards the other wider missions that librarianship contains. In the end, it is what will save us five years from now. There has only been one department in the 375+ year history of Harvard that has ever been dismantled and that was the Geography Department. Since then many other Geography Departments have been dealt a similar fate including the one at my My Own Place of Work which disappeared some years before I started my employment there. Some of its faculty remain at the university, either exiled to Sociology or Political Science or regrouped as Earth Sciences, depending on which of The Two Cultures they pledged allegiance to. I have an undergraduate degree in Geography and Environmental Science and as such I sometimes feel that I'm part of an academic diaspora. So after almost 20 years of librarianship I've made one of my sabbatical goals to ‘re-find my inner geographer.’ My hope is that through my readings I will be able to find and apply some of the theories and tools that geographers use in my own practice. I think I have already found a good example to use a starting point as I try to explain in this post what sort of ground I'm hoping to explore and how it may apply to librarianship. It came to me as I was browsing through the most recent issue of Antipode: The Radical Journal of Geography when my eyes immediately fell on an article whose topic was literally close to home. It was an article about migrant worker experiences in “South-Western Ontario”. I had to download and scan most of the article before I could learn that what was being referred to as ‘South-Western Ontario’ was actually East of where I live. And that’s when I noticed that the official keywords associated with the article (migrant workers; agriculture; labour control; Seasonal Agricultural Workers Program) made no mention of place. And this struck me as a curious practice for a journal dedicated to *geography*. But I know better to blame the editors of Antipode for this oversight. The journal is on the Wiley publishing platform (which they call the “Wiley Online Library”, huh) which provides a largely standardized reading experience across the disciplines. On one hand, it’s understandable that location isn't a standardized metadata field for academic articles as many papers in many disciplines aren't concerned with a particular place. On the hand, I do think that is telling that the within academia there is much more care and effort dedicated to clarifying the location of the author rather than that of that of the subject at hand. There is another reason why I'm concerned that the article at hand doesn't have a metadata field to express location and that is this: without a given location, the work cannot be found on a map. And that’s going to increasingly be a problem because the map is increasingly where we will live. You may know that Google became the pre-eminent search engine based on the strength of its PageRank algorithm which, unlike its peers at the time, created relevance rankings that takes into account the number of incoming links to that page as a means to establish authority and popularity and make it less immune to spam. In those heady, early days of the Internet finding news and more from around the world was deliriously easy. Oddly enough one of the challenges of using the Internet back then was that it was hard to find info about the features of your small town. The Internet was wonderfully global but not very good at the local. But now, in 2014, when I search for the word ‘library’ using Google and I receive my local library system as the first result. This is because Google is now thought to incorporate 200 some factors in its page ranking. And one of the most important factors is location. In fact, I would go so far to say that, just like real estate, the three of the most important factors for search is location, location, location. It's location because if you search for political information while in Beiing your experience using the Internet is going to be significantly different from that of Berlin because of government enforced filtering and geofencing. It's location because if you search for Notre Dame in the United States you are probably going to get something related to football rather than a cathedral in Paris. 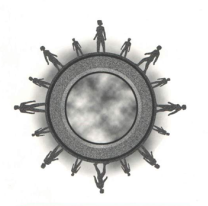 And it's location because so much of our of information seeking is contextual based. If I'm searching for information about a particular chemical additives while at a drug store, it’s probably because I'm about to make a consumer choice about a particular shampoo and not because I need to know that chemical's melting point. While it’s difficult to imagine navigating a map of research papers, it is much easier to understand and appreciate how a geographical facet could prove useful in other interfaces. 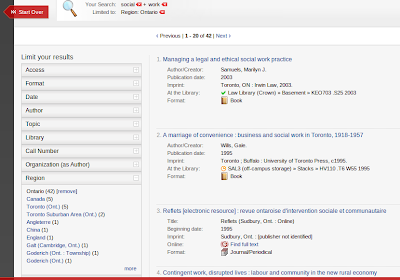 For example, if I'm looking for articles about about a whether particular social work practice conforms to a particular provincial law in Canada, then the ability to either pre-select articles from that province or filter articles to a list of results pertaining to that province could prove quite useful. It's surprising how few of our library interfaces have this ability to limit by region. Summon doesn't. Neither does Primo. But Evergreen does and so does Blacklight. There are other examples of using maps to discover texts. OCLC has been experimenting with placing books on a map. They were able to do so by geocoding Library of Congress Subject Heading Geographical Subdivisions that they parsed so that they can be found on a map on a desktop or nearby where you are while holding a mobile phone. And there are many, many projects that seek to place digitized objects on a map, such as the delightful HistoryPin which allows you to find old photos of a particular place but of a different time visible only when when you look through the world through the magical lens of your computer or your mobile phone. Less common are those projects which seek to make available actual texts (or as we say in the profession the full-text) accessible in particular places outside of the library. One of my favourite of such projects is the work of Peter Rukavina who has placed a Piratebox near a park bench in Charlottetown PEI that makes available a wide variety of texts: works of fiction (yes, about that red-headed girl), a set of city bylaws, and a complete set of community histories from the IslandLives repository. When you think about embedding the world with a hidden layers of images and text that can only be unlocked if know its secrets, well that sounds to me like a gateway to a whole other world of experience, namely, games, and ARGs or alternative reality games in particular. Artists, museums, and historians have created alternative reality games that merged the physical exploration of place with narratives and as such have created new forms of story writing and storytelling. Personally, I think its very important that libraries become more aware of the possibilities of in situ searching and discovery in the field and there are many fields worth considering. Over the holiday break, I bought the Audubon Birding App which acts as field guide, reference work, includes a set of vocal tracks for each bird to help with identification, allows the creation of to store my personal birding life list, and a provides means to report geocoded bird sightings to eBird -- while being half the price of a comparable print work. We, the people of print have a tendency to dismiss and scoff at talk of the end of the print book, but I don't see any of our reference works on our shelves providing this degree of value to our readers like this app does. In my opinion, there’s not enough understanding of this potential future of works that take into account the context of place. Otherwise, why would our institutions force our users to visit the a physical library in order to access a digitalize copy of historical material that we might have already had in our collection but in microfilm? So, as you can see, there’s a lot of territory for myself to explore during the next 12 months and I think I'm going to start by going madly off in all directions. I do hope that by the end of this time I will have made a convincing argument to my peers that we have an opportunity here to do better. I hope that one day the article in question that I started this train of thought - the one about migrant agricultural workers in South-Western Ontario - should, when and if its included in an in a library maintained institutional repositories, have a filled out location field. And then perhaps one day, those in the future who will work those fields in South-Western Ontario can discover it where they work.